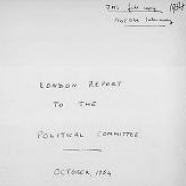 From box CP/CENT/PC/02: FILE 22: Documents on health and on elections, George Matthews' notes and report by LDC to PC, 1954. -- FILE 23: Documents, including on the Jury system and social security; correspondence; notes,1955. See also PC Sub-Committee files for these years. CP/CENT/PC/02/22: Documents on health and on elections, George Matthews' notes and report by LDC to PC, 1954. CP/CENT/PC/02/23: Documents, including on the Jury system and social security; correspondence; notes,1955.